Offers improved features for modeling "in context" like built-in Google Maps for easier geo-location, color imagery and more accurate terrain, deeper integration of Building Maker, moreover Solid Tools for additive and subtractive modeling and volume calculation. 2D image export (example here). N.B. It works better under Wine than under the Windows 7 machine I dual boot with, as has lots of graphic glitches with SketchUp 8 (e.g. with the select tool), and Linux has middle mouse support for my laptop touchpad (pressing left and right together) - newer versions of SketchUp are also currently not an option where I do work, so using SketchUp 8 on both Linux and Windows works well. Double click on "HW_OK" and change the 'Value data' from 0 to 1. As I was fed up of having to do this and other 'tweaks' I made a small, currently 'beta' stage script to do this, available here: https://github.com/wilfm/SkipI - Feedback wanted and welcome! For this test I installed without (but with the above fix) and then with this script on a freshly reinstalled Fedora 21 box, and both work great. I tried installing it downloading from the web page but it required c++ and .net and the installation hanged. So I installed Sketchup 8 from winetricks and it worked fine with the regedit fix. As i can't edit comments here. Just adding a Thank You, to the bottom of that last one. Has anyone tested this on linux mint? Sketchup 8 under wine of any version, preferably on the latest version of mint. Does the fact it has worked on other linux distribtuions, and been recorded here to do so, imply it ought to? I think some of the distributions it was tested under are the one's which linux mint is a "daughter/son/futher development" of. I wanted to ask, i notice from this page that there have been some problems with certain sketchup features when trying to run sketchup 8 under wine. Particularly with image export using file-->export-->2d graphic. I wanted to know if sketchup plugins which worked when running sketchup 8 on windows still work when using it under wine. Does sketchup under wine still have the folder C:\Program Files\Google\Google Sketchup\ (version numbers...) \Plugins and the ability to run .rb files placed in there? I'm thinking of switching from windows to linux soon and want to check whether this program and it's plugins will still work. The plguin i am specicifically thinking of is an old kerkythea export su2kt plugin. If this question would be better "posted" elsewhere then feel free to move it to a more appropriate location. 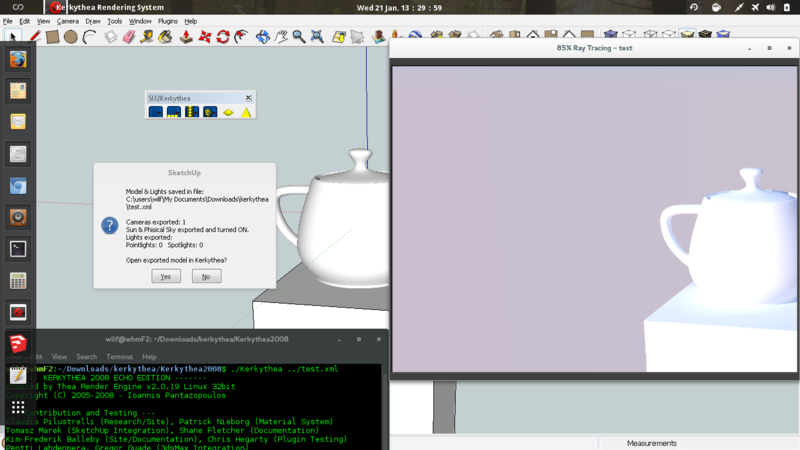 Sketchup 8's 2d export does work (example from my fedora 21 box here: i.imgur.com/mvPPoWS.png ). My sketchup setup also seems to work with most plugins (a few plugins I tried a while back that didn't work I think required unavailable stuff), but copying scripts to the plugins folder (in my case /home/wilf/.sketchup8/drive_c/Program Files/Google/Google SketchUp 8/Plugins) and using extension installers also works. BTW, other rendering programs are available with sketchup plugins - in the past I have used Indigo Renderer (non-free, trial version): www.indigorenderer.com/ and Luxrender: www.luxrender.net/en_GB/index . They take a bit longer than Kerkythea, but high quality images can be produced - e.g. for some work (on a 'Ubuntu smartwatch') last year, I did this using Indigo: dl.dropboxusercontent.com/s/oe7dj4ml3thsc5s/Wilf-D%26T-Yr12-Watch.png . Thanks for the advice you have given. su2kt works, and blender can run natively or under Wine in Linux - the kt2obj might work (I haven't tested it), you might need to install java or net or something under Wine. 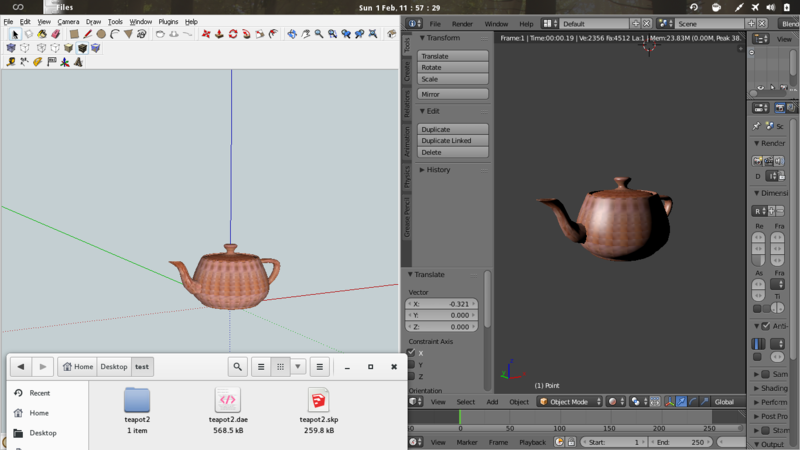 With blender you sometimes have to add lights, change to the render view and stuff to see textures. When exporting to DAE it appears the textures and stuff are stored in a directory with the same name as the exported DAE file - you probably have to move that as well if you move the DAE. Blender also helps editing models that are to be 3D printed as SketchUp sometimes makes a mess off things. Try things and see what happens! Winetricks (part of my Wine 1.4 installation) can't install Google SketchUp 8 as the automatically downloaded file repeatedly gives incorrect checksum result. I'm a Noob to Wine/Ubuntu (Precise Pangolin)... what can I do or is this a Google error? Please be gentle. Download it manually from google's website and install. I also ran into this problem so I've reported it as a bug. i've found very useful article with some links to registry keys to get sketchup working. couldn't get SU working without these "brilliant" patches. Had to disable splash screen, inspector and enable hardware acceleration. Hope this helps. Do you need a shell script to run it on Wine? If you interpret 'Do you' as meaning 'Does one', the answer is yes. The actual question is for you to answer. I have written a simple one. There doesn't seem to be anywhere to upload it on AppDB, so let me know if you want me to send it to you. It's small - 111 Bytes. The pointer of the mouse is always pointing few millimeters above the arrow. nikitron@terminator:~/Рабочий стол$ wine "Google SketchUp 8.desktop"
Had to switch the value of the regedit key to "1" to get past the error message: SketchUp was unable to initialize OpenGL! Please make sure you have installed the correct drivers for your graphics card. Turns out when SketchUp started, none of the keybindings for short-cuts was active. When I clicked "Reset" in the Windows-Preferences-Shortcuts dialog, then the traditional key stroke short-cuts worked. The reg key, above, for SketchUp8 should be HKEY_CURRENT_USER/Software/Google/SketchUp8/GLConfig/Display. The default value for the Data is 1. I wasn't planning on upgrading to 'Precise' for this. i have sketchup 8 PRO, and the sketchup applications seems to work fine, but the Layout and Style Builder are not working. They crash at the start. will produce a crash in SketchUp. With Wine 1.3.3, the Ruby console works perfect. If the keyboard shortcuts don't work by default (they should, and they worked in previous versions), you can assign new shortcuts in the preferences. Exporting the view in a 2D format (free version) like PNG, TIF, or JPG I get a "white" image (sometimes a "black" one). Same here. "Print Screen" is okay.. but not the quality of "real" images. 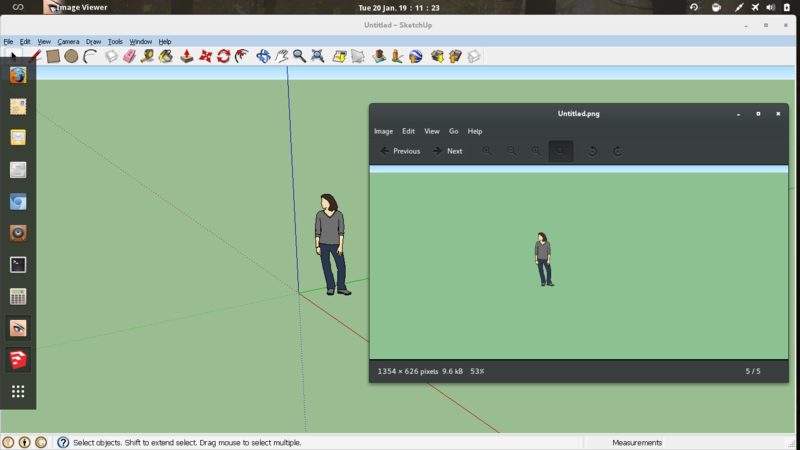 Update: i think this could be a problem of Gnome, cause in my new Lubuntu Notebook SketchUp8 can export image!!!! It sounds a bit strange..... I tried with my desktop, and it works again..... I use Lubuntu 12.04 64bit and SketchUp 8.... what do you use? Does not allow me to enter text in the text input fields for scaling objects. If I move the cursor to the field, it appears to lose focus on the object. I don't know if this is normal or not, but the help files indicate that you can resize objects by entering the desired dimensions as text. It seems to work as normal. It is supposed to be intuitive that you can select something, type a length and hit enter. There is no need to give focus to the measurements box.